At WeGotLites.com our #1 priority is to ensure our customers get the best deals on the market. We offer a 125% Price Match Guarantee*. This means, we will match our competitors’ prices and then provide an additional 25% discount off the difference in price. The item is the exact same make and model and made by the same manufacturer. The product is not advertised as a sale, close-out, clearance or discontinued. (This offer is not eligible for items offered by Online Auctions or "Flash Sale" websites). The advertised price is from an authorized U.S. retailer (online & offline). The price must be a published price or you must have a written quotation from a competitor. Verbal price quotes are not acceptable. The Low Price Guarantee cannot be applied to previous orders; only applicable to new orders and open quotes. 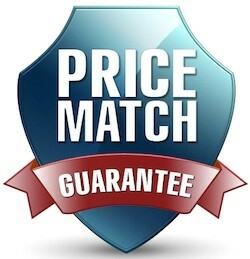 All Price Match Guarantee Sales are Final. No refunds are available once the order is placed. Coupon codes cannot be combined with Price Match sales orders. To place your order, please call us toll free at 866-415-4837 or contact us through Live Chat. Before contacting us, please make sure you have the complete URL (address) of the competitor's web site, and the details of the competitive pricing offer so that we can better assist you. You may also email the information to support@wegotlites.com and we will respond to your inquiry as soon as possible. *The Low Price Guarantee cannot be combined with any other coupon or offer, closeouts, clearances, bulk quantity items, or typographical errors. Offer does not include wholesale, "trade," contract, manufacturer direct pricing, or below wholesale cost pricing. Offer does not apply to parts, bulbs, or specialty items. Specialty items include all Aladdin products. *Products must be first quality, all new, factory-sealed, of the same brand, style, finish, and SKU number to be eligible for our Price Match Guarantee. *The brands listed below are excluded from any Price Match Guarantee or price reductions due to Manufacturers request. Minka Aire, Minka Lavery, George Kovacs, Metropolitan, Ambience by Minka, The Great Outdoors. We apologize for this inconvenience. *WeGotLites.com reserves the right to determine which offers are from authorized retailers. In the event that WeGotLites.com determines that the competitor's offer does not qualify for the Low Price Guarantee, you will be notified within 30 days.